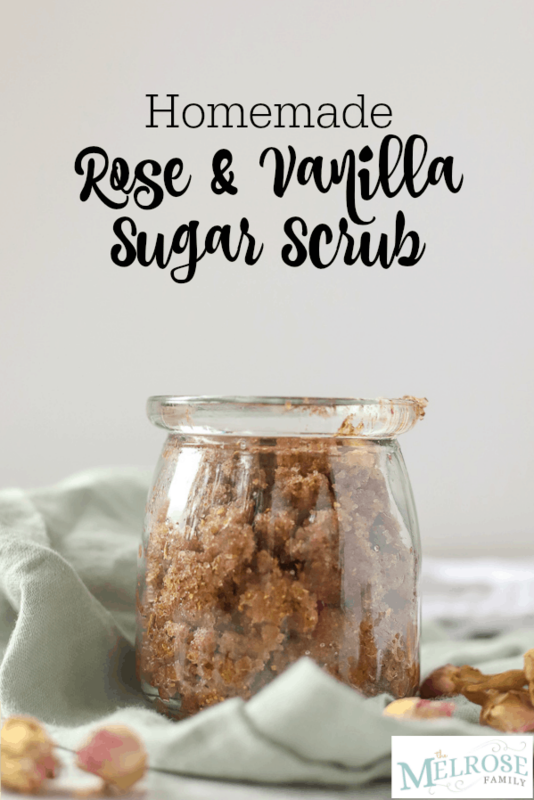 Homemade sugar scrub with vanilla and rose is the perfect homemade gift for Valentine’s Day. The sweet smell of roses accompanied by the warmth of vanilla really makes this sugar scrub stand out. Give it as a gift or keep it for yourself. Follow my tips below when making homemade sugar scrub. Ingredients you will need: sugar, dried roses (or rose petals), oil, and vanilla extract. Valentine’s day is one of my favorite holidays, and the girls just “love” it. See what I did there? They love giving their friends fun gifts, like these Love Bug Fruit Cups, while we also enjoy giving their teachers fun gifts they will actually use. This would be the perfect teacher’s gift. Just put it in a pretty jar and decorate it, then top it with candy or a gift card to grab some coffee or wine… ’cause hello, teachers need relaxation, too. Back to homemade sugar scrubs. There are so many ways you can make a sugar scrub. This time around, I wanted to make it more Valentine’s Day themed, and what screams “Valentine’s” more than roses? Nothing. Well, maybe also chocolate. When you add dried roses and vanilla together, it is a really amazing smell. It’s very relaxing; a slight floral scent with the warmth of vanilla. Yum. But don’t eat it! 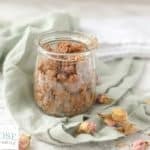 I already had dried baby roses on hand, but if you wanted to give your homemade sugar scrub a brighter color, use just dried rose petals. What type of oil works for sugar scrubs? For this recipe, I used avocado oil because it is clear, but you can use whatever oil you like. For example, olive oil, jojoba, apricot seed, etc. would all work well. You could use regular white sugar or raw sugar in this recipe. Regular white sugar: this is great for the body and face. How do you use a sugar scrub? Get your body or face wet. Scoop a small amount of sugar scrub into your hands and rub on your face and/or body. Rinse off . Your skin will feel rejuvenated and moisturized. Use a clear oil. Olive oil will give it a green tint. Incorporate dried rose petals for a brighter pink look. You could give this recipe even more of a rose smell with a few drops of rose essential oil. Double the recipe to make it for more than one person. 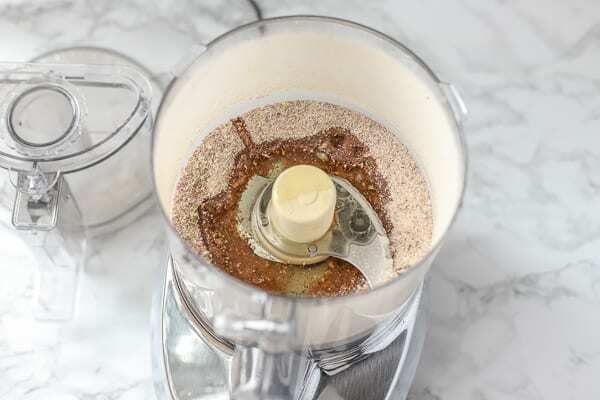 The only special tool you will need is a food processor. A blender may work if you scrape down the sides quite a bit. Or you could use a spice blender to pulverize the dried roses, and then add it to the sugar. In a food processor, add in sugar and dried roses. Add in oil and vanilla extract. Pulse a few more times until combined. Store in a container for up to a month. Decorate it and give it as a gift. Want more cute Valentine’s Day ideas? Bath Heart Burst Valentine’s – this is a great non-candy Valentine’s idea. Valentine’s Day Party Ideas – there is a ton of adorable party inspiration here. Red Velvet Heart Cookies – nothing says the love holiday like red velvet and heart-shaped cookies. Hogs & Kisses Valentine – give this fun, healthy snack for the kids party. Check out my friend Amy’s Ultimate Guide To Sugar Scrubs here. 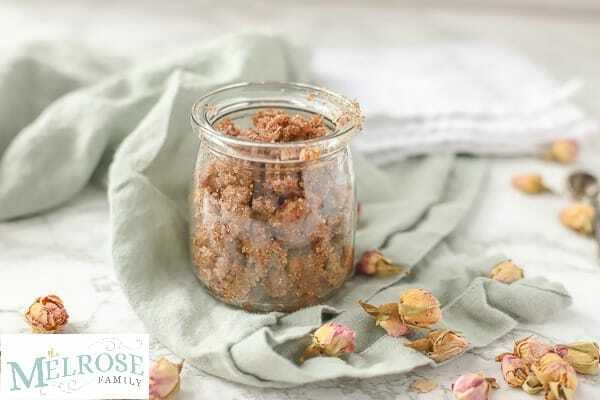 Simple homemade sugar scrub with rose and vanilla makes the perfect homemade gift. 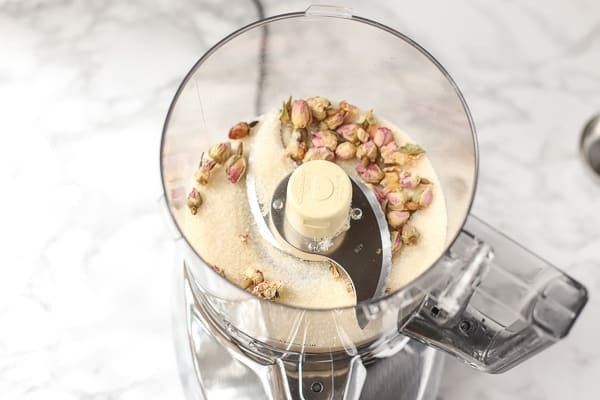 In a food processor, add in sugar and dried roses and blend until the roses are powder-like. Store in a container for up to a month. Decorate to give as gifts. What is your favorite sugar scrub to make?